Laminate and luxury vinyl plank (LVP) are both considered a great flooring option for heavy traffic and families with children and pets that need a strong, durable floor. If you are looking for an alternative to hardwood that is very durable and holds up well to almost anything, then they are both options to consider. Some differences between the two can make one better than the other for your home. Both of these types of flooring are designed to mimic hardwood. While the technology to replicate hardwood has improved over the years, they both still have a slightly synthetic look and feel to them. Because laminate is made out of a wood composite, it can feel slightly more realistic than luxury vinyl. While luxury vinyl has been able to replicate the look and texture of hardwood, it is still made out of plastic which gives it a slightly different look. That being said, luxury vinyl has come a long way from other vinyl products, such as sheet vinyl, and does a very realistic job in replicating the look and feel of hardwood. 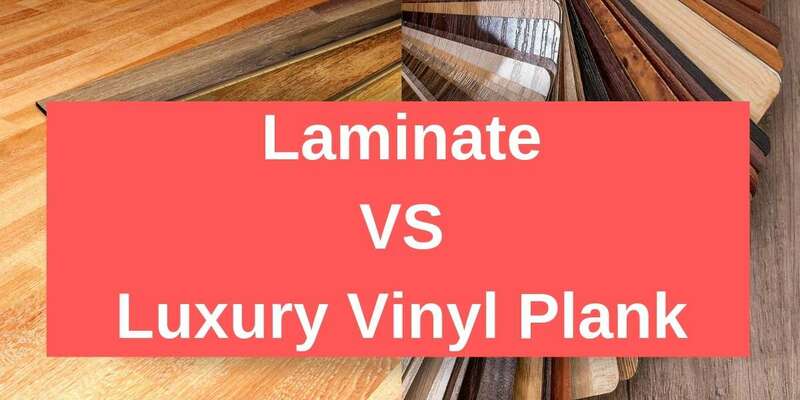 Both laminate and LVP are extremely durable, and hold up well to most things. LVP, like all vinyl flooring, is much softer than laminate, which means that it is prone to dents from heavy furniture, and it is possible to rip. Luxury vinyl holds up well to scratches and dings. The main issue that you may have with laminate is that the top wear layer can be prone to scratches and small nicks, which over time can make the laminate appear dingy. Unlike hardwood, these types of scratches can’t be refinished or repaired. Maintenance is one area that laminate floors fall short when comparing is to luxury vinyl. You can clean luxury vinyl using just about any method as long as you aren’t drenching the floors with water. You’ll want to avoid extra water to prevent water from seeping in between the planks and possibly damaging the subfloor. Otherwise, luxury vinyl gets clean easy with a mild cleanser and a steam mop or regular mop. Water resistance is the one thing that completely separates laminate and luxury vinyl floors. While luxury vinyl is waterproof, laminate flooring is not. Laminate has a wood core that is prone to swelling and can easily be damaged by water. Any possible spills or liquids on the floor, need to be wiped up immediately to prevent any possible damage. This also means that laminate is not a good option for rooms in your house where there may be water or moisture, such as bathrooms or mudrooms. Both luxury vinyl and laminate are great options to consider if you are looking for a flooring that can withstand just about anything. They are very strong and hold up well to wear and tear. For more help choosing the right flooring for you, give us a call or stop by, and we can help you choose a flooring that is perfect for your home, your lifestyle, and your budget.